For a fourth year in a row, we hosted a trivia challenge from December 26, 2014 through January 2, 2015. Eight Neopian trivia questions were presented in the bottom right corner of JN on each of the eight days of the challenge. Day 1 (December 26th): What Neopet appears in the Christmas Scene Stamp? Day 2 (December 27th): What species used to be known as the Mellish? Day 3 (December 28th): Who did the Desert Scarabs encounter in the desert after stealing King Hagan's treasure? Day 4 (December 29th): What land got an overhaul in June of Year 11? Day 5 (December 30th): The Soup Faerie appears in a wintery game with which other Faerie? Day 7 (January 1st): Who blocked the Eastern Pass of Terror Mountain? Day 8 (January 2nd): Who claimed to have surpassed three ancient wizards? Everyone who answered at least one question correctly received a trophy in their jnAccount trophy cabinet. This amounted to 2,429 users (far too many to list here individually)! We also awarded everyone one cabinet claim! Redeem your claim now. Keep your trivia skills sharp and ready for next December! 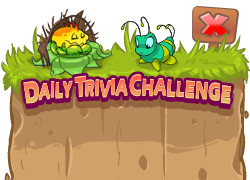 To distract Neopians from the transition downtime, we hosted a trivia challenge from September 18, 2014 through September 21, 2014. 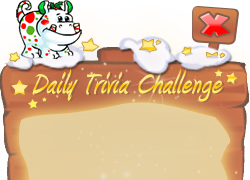 Four Neopian trivia questions were presented in the bottom right corner of JN on each of the four days of the challenge. Day 1 (September 18th): What is the full name (with title) of the Kougra who created Habitarium? Day 2 (September 19th): This Snorkle used to run the Cake Calamity game in Petpet Park, and spoke with a heavy French accent. Day 3 (September 20th): In Habitarium, you were able to look after a Mootix, a Pinchit, and what other petpetpet? Day 4 (September 21st): What is the name of Winsela's evil sister, who often played tricks throughout the Park? Everyone who answered at least one question correctly received a trophy in their jnAccount trophy cabinet and the "Cabinetarium" trophy cabinet theme. This amounted to 2,334 users (far too many to list here individually)! Keep your trivia skills sharp and ready for this December! This page was last updated on June 20, 2017.